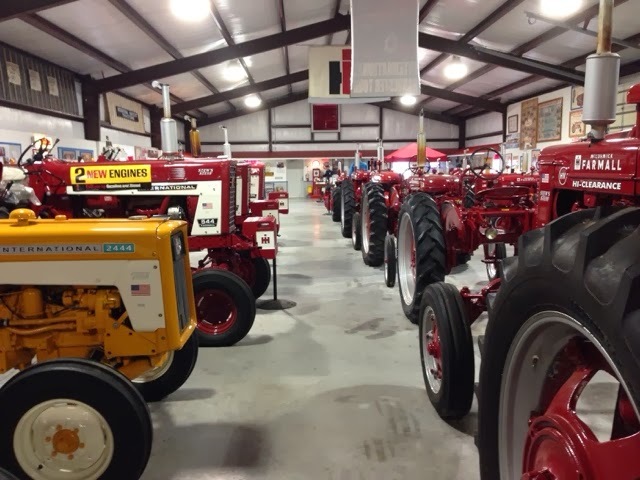 If up I build it they will come, and they do at the rate of 50 to 60 per day to the Paquette Farmall Tractors Museum. What do you do on yet another 53 degree rainy day in Florida? Go to a museum. 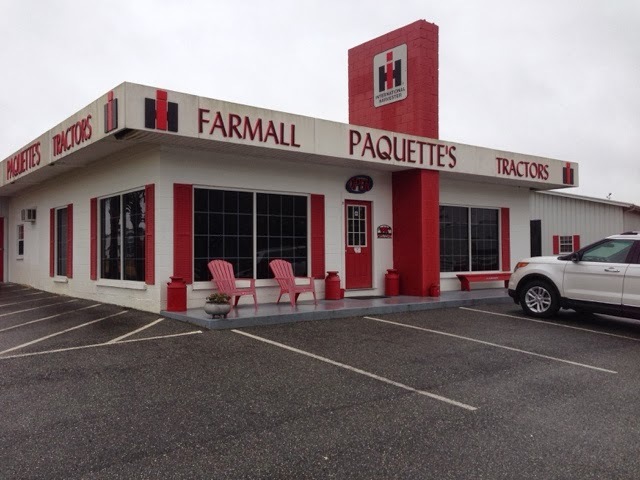 I use the Roadside America app on my Idevices and I looked up what was near by and Paquette's Farmall Museum came up. For some reason I had in my head this place was probably rinky dinky but my mind started to be converted with the well placed and quality signs announcing the turn off Highway 44 in Leesburg, only a few miles from where I have been staying. The drive down the dead end road would take me by a number of delaputated houses some not livable, that caused me concern about what I might see. My hopes went up again as I made the turn at the end on to another road that opened up to large fields with nice houses and large farm buildings set in open fields. The museum entrance is in the building in the building in the picture above. I pulled into the parking lot and could pick any spot I liked. Across the street you can see where there is extra parking when they get crouded. As I entered the price of $10.00 for adults was posted on the door. Entering the building I thought I was in a Crackerbarrel Restaurant with memorabilia all around and much for sale from tractor toys to young girl dresses with tractors on them. Straight away a middle aged woman greeted me with the same greeting style that I would get at any museum, asking me what brought me to the museum with a bright pronounced smile. I think she was expecting me to say I love farm tractors and or I grew up on a farm from the reaction on her face. My response was that I was looking for an oddity to occupy my time. Catching her strange look at me, I did further explain that I do like tractors and have been to tractor shows and find the interesting as well. Apparently this is a Mecca for farmers and those that love farm tractors, specifically Farmall and Internationsl Harvester (IH). Oh, your wondering about the love story. You have to wait a bit more. She directed me to exit this building and go to the main museum building next door where I would meet Ken my tour guide. I did and met Ken waiting for me, as she had radioed him with my impending arrival. A warm smile geeted me with a strong handshake welcoming me to the museum. He then have me an overview of this large building and another large building across the street and then a smaller building behind the first one. 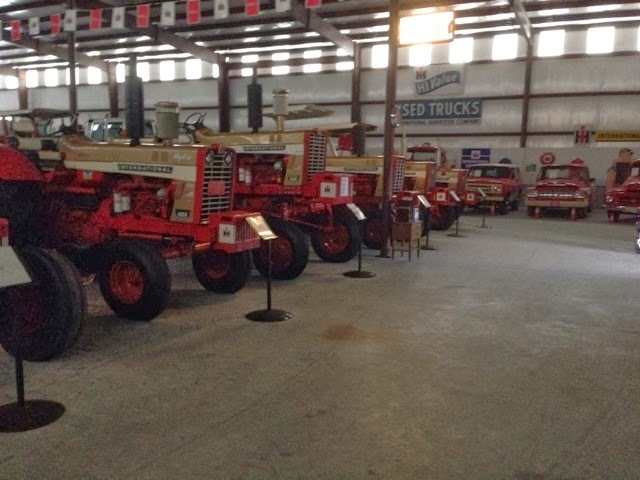 Ken retired a few years ago and winters in FL with his home north of Lancing, MI where he had a 3000 acre farm, and now volunteers at the museum with tractors having spent years with them. This one building has about 500 tractors from the Cub Cadet to large IH. There is a lot of models and data for farm tractor enthusiast, but this is not my story. As I walked down the isles of tractors I saw the love. J. Stewart Paquette's Stuff was marked on nearly all perfictly restored tractors in this collection. I have a huge respect for Clay Swenor whom I previously wrote about visiting on this trip, for his eye to detail, patience, and love for the quality of restoration. I saw the same here, no felt the same love here in this display. Who is Stewart Paquette that created this magnificent collection, building and grounds? 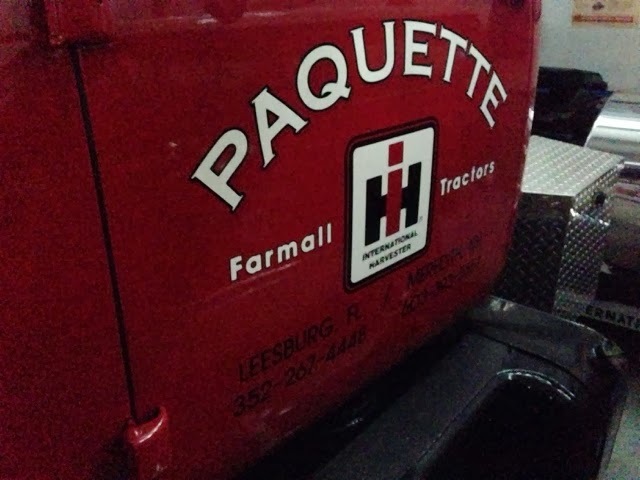 Mr. Paquette is from Meridith, NH, where he owned an asphalt paving business. The woman in the ticket office says that what ever he does he does it "right". There is no question in my mind his commitment to doing it right. For me I saw love. If you ever tried to restore anything you know the labor of love the whole process is to get it right Now multiply this times hundreds of restorations, multiple building, and the creation and management of a museum. Getting it right also means that if you plan on showing off your work in a museum in a Mecca for people that like tractors, you better get it right as your audience will have a critical eye. The picture below is of thesecond large museum building with larger tractors, some pickup trucks, and some equipment waiting for restoration. There were other consumer products like refrigerators that Farmall also made. There were special products made for tractors. They include cotton pickets, combinders, and early loaders that used vacuumed assistance for lifting, a precursor to hydraulics. The final building has a rolling video about tractors, but it is filled of Ameticana along the walls, with the center left open for the public to rent for meeting space. This Museum was well worth the $10.00 entrance fee. It wasn't the tractors that I was amazed at, but the commitment, desire, and yes love. I want to show one of the non-tractors. 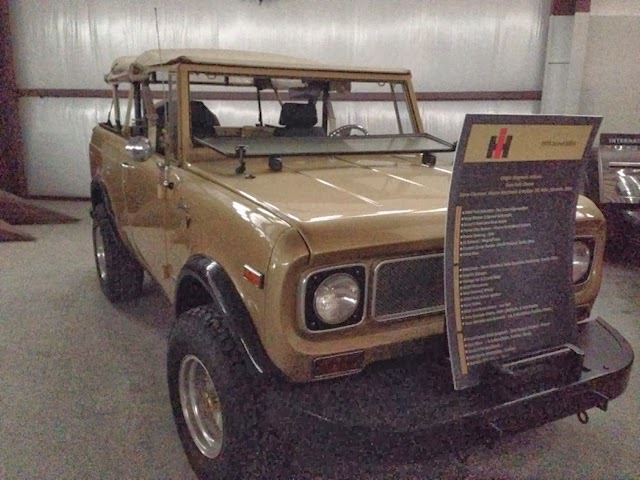 This is an IH Scout from Kingman, AZ that is in great condition and has a number of modifications listed on the cardboard mounted on the bumper. One modification is the fold-down windshield.